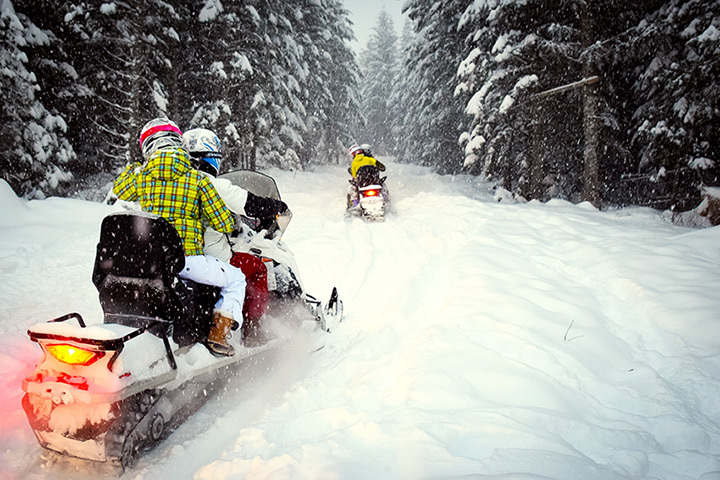 Fifteen extraordinary Snowmobiling Destinations to check out this winter! If you love the idea of testing yourself against the Alaskan wilderness but you're not a dog person or you don't want to spend 15 days out there, you're in luck. The Iron Dog Course follows most of the Iditarod trail, diverting around some sections not suitable for snowmobiles. While there is a highly competitive race that follows the course which has seen completion in under 48 hours, you can expect to spend something more like a week tackling the more than 2,000 miles between Anchorage and Nome. Temperatures below -57 degrees Fahrenheit have been reported along the trail, so be sure to dress warmly! For a less intense experience that still provides breathtaking vistas, pay a visit to Kanab, Utah. Located at the Southern end of the state near Grand Canyon National Park, the area is known for being where dozens of Westerns were filmed thanks to the stark beauty of its amazing stone formations raising above the desert floor. While cowboy movies might call to mind hot summers, up in the mountains of the nearby state parks snowmobile trails are usually groomed and provide otherworldly views of geological features like Red Mountain covered in snow. The Appalachian Mountains are beautiful year round, but snowmobiling in Ohiopyle State Park grants a unique perspective on the region's natural majesty. Groomed trails in the park offer access to a large portion of the area's varied terrain and the rare opportunity to see some of Ohiopyle's famous waterfalls and rapids features frozen over. Tours of Frank Lloyd Wright's nearby masterpiece Fallingwater are also available through December. Elkin's Resort in Priest Lake Idaho lets you use a snowmobile as your primary mode of transit. With around sixty inches of snow falling in the area every year, there's a wide variety of terrain to explore. You can speed across the huge frozen lakes or climb high into the surrounding mountains, and the trail system links snowmobilers to the area's restaurants with a series of guideposts. While staying at Elkin's Resort you can walk out the front door, hop on a snowmobile, eat out for lunch and dinner, enjoy the resort's warming cabins, and return to your room all without ever using a car. Snowmobiling is of course right at home in New England, and nowhere in the region is better for experiencing the sport than Mount Snow in Vernon, Vermont. With reasonably priced rentals and guided tours available through several providers, there really isn't a better way to explore the backcountry of the Green Mountains. Mount Snow also offers a wide variety of kid's activities and daycare services if you want to hit the trails but can't take your little ones. Yellowstone National Park in Wyoming is on most everybody's must-see list for all the obvious reasons. The wildlife, the unspoiled majesty of its old growth forests and soaring mountains, not to mention the iconic signs of volcanic activity like Old Faithful. But, you don't have to go hiking and stand around with hordes of tourists on summer vacation to see one of the country's greatest parks. In the winter there are snowmobile trails and tours guided by rangers that will let you see a rarely experienced side of Yellowstone. If you visit Ohiopyle in the winter you might find yourself stopping in nearby Pittsburgh Pennsylvania, but when it comes to a real international snowmobiling mecca, you really need to visit the Pittsburgh in New Hampshire. Called one of the Top 10 locations for Snowmobiliers by Snowmobiles.com, the area boasts over 200 miles of trails to explore. Make sure you bring your passport though, this trail network lead all across not just New Hampshire, Maine, and Vermont, but all the way into Canada. You're more likely to run into moose than Mounties, but be prepared. Michigan's Upper Peninsula is an always-popular choice for snowmobile enthusiasts. With thousands of miles of trails all across the upper half of the state, this is a great area for planning town-to-town trips and exploring the countryside. Much of the Upper Peninsula's winter business relies on snowmobilers, so expect to see plenty of places to shop, eat, drink, and stay that want to cater to people like you. Breckinridge Colorado is a popular ski destination in the Rockies, but every winter athlete has reason to love this mountain. Breckinridge Snowmobile tours offers quite a few options for snowmobilers ranging from tours designed for complete beginners to some of the region's most challenging courses for seasoned sledders. The High Adventure Tour includes everything you need to explore the mountain at elevations above 12,500 feet, including a guide, high-altitude gear, and supped-up snowmobiles designed for your high performance venture up to where the airliners fly. Hell's Canyon in Oregon is a scenic byway most of the year, but winter snowfall turns it into a slice of heaven for sledders. With 900 miles of trails accessible from the interlinked municipal there's almost no end to the gorgeous scenery to take in as you travel from town to town in the region, exploring local cuisine and historic sites from the tail end of the Oregon Trail. Fortunately you're not relying on oxen or sleeping in a covered wagon, so you can focus on enjoying all of that snow! The Berkshires of Western Massachusetts are a great place to explore on a snowmobile. The region has an active community of sledders and a trail network linking the charming towns that dot the forested hills. The Berkshires are packed with hidden avant-garde dining, classic antique shops, and eclectic galleries. There's a lot more here to explore than just the trails, but with over 1,000 miles of easily accessible tracks, there's more than enough for to scratch that snowmobiling itch. Covered Bridges keep snow from piling up during the winter, and have become an iconic image of winter in the North East, and you can visit 10 of them across upstate New York as part an annual challenge hosted by the NYSnowmobileWebMap. Sledders will have to cross over 660 miles and stop in at each bridge, all of which offer something unique from friendly camels in private preserves to railway museums. The trip is meant to be planned online with a custom designed app, so all your options for dining and lodging are readily available. Lake Tahoe on the border between California and Nevada (both sides are great) is a popular year round destination, but it really shines in the winter. There's plenty of backcountry snowmobiling to be had, great hotels to stay at, and the lake itself. You can explore the mountains both on and off trail, and enjoy the resorts. Excellent on-lake sledding is also available, for those who want to really open up the throttle and feel the speed. Rich Ranch in Seeley Lake Montana isn't just a place to go snowmobiling, it's an escape like few others. The ranch is full service, meals, lodging, and rentals (if you need them) are all included. The property grants access to 600 miles of groomed trails and 1000 more backcountry trails and more unmarked sledding than you can shake a stick off of one of the area's gorgeous cedars at. The ranch claims that during a weeklong all-inclusive stay you won't see the same section of trail twice if you don't want to. Cook County Minnesota had hundreds of miles of snowmobile trails to explore, and family owned businesses ready to warmly welcome sledders. Several historic trails run through or connect with the area, including Lutsen-Tofte, Grand Marais, the Gunflint Trail and Grand Portage. With more than five feet of snow being average for the area and typically cold winter weather Cook County offers some of the most reliable access to excellent snowmobiling in the country.